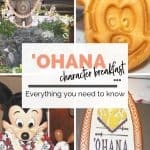 You are here: Home / Disney / ‘Ohana Character Breakfast – Is this the Best Disney Character Breakfast? 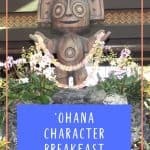 ‘Ohana Character Breakfast – Is this the Best Disney Character Breakfast? The plane tickets are booked, you used the crowd calendar to determine which days are better spent at each park and now it’s time to make those Disney character meal reservations. 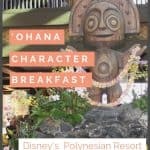 If you are looking for a fun, high-energy, family-style breakfast, look no further than the ‘Ohana character breakfast. 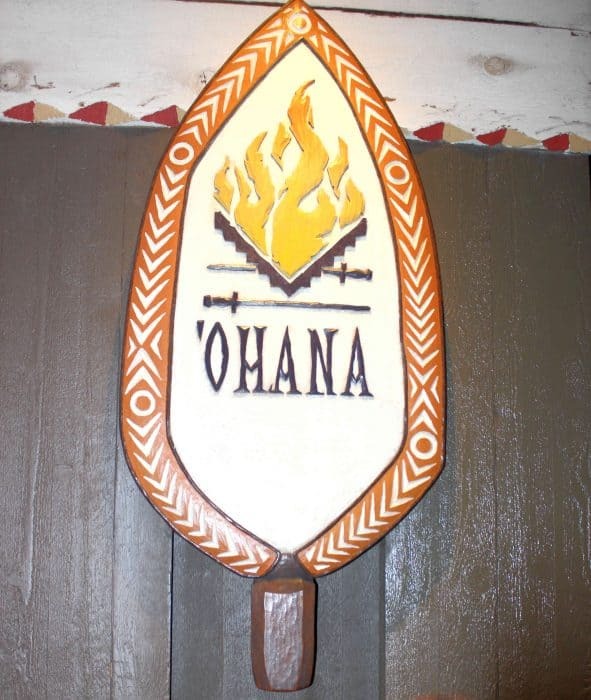 ‘Ohana is in the exotic Disney Polynesian Resort. It is on the second floor – same as the monorail station. If you are lucky enough to get a window seat, you will be rewarded with a Seven Seas lagoon view and also the hotel’s new over the water villas. 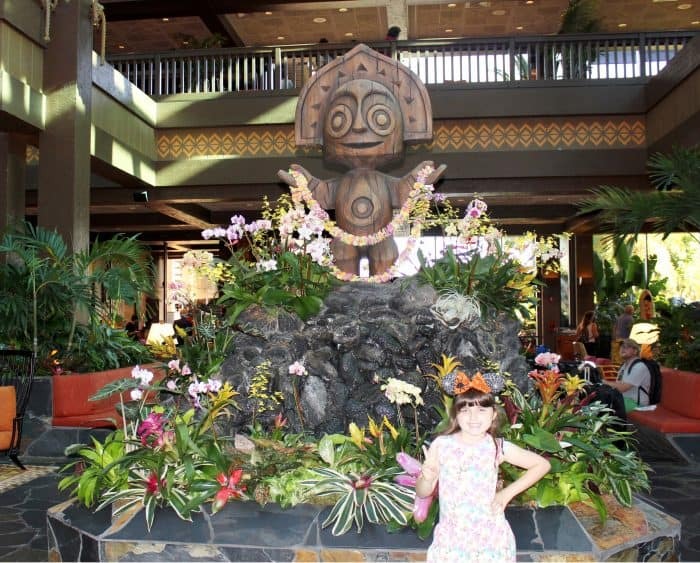 Disney’s Polynesian Resort is easily accessible whether you are staying on Disney property or not. Since it is on the monorail loop around the lagoon, you can access it from the Ticket and Transportation Center (TTC), The Magic Kingdom, or one of the other hotels on the monorail. If you are only going to Ohana’s character breakfast and driving from an off-property resort, you do NOT have to pay for parking. Tell the parking attendant you are here for a character breakfast. I usually take a printed copy of my reservation, but in recent years they check your name from a list. Disney allows you 3 hours of free parking. We do this breakfast on a non-park day. Since we are usually here at some holiday (most likely in November or December), we use our 3 free parking hours to also take the monorail around and view the other hotels Christmas decorations – by far the Grand Floridian’s décor is amazing. You need to check out the life-size gingerbread house – it’s actually a store selling gingerbread! YUM! 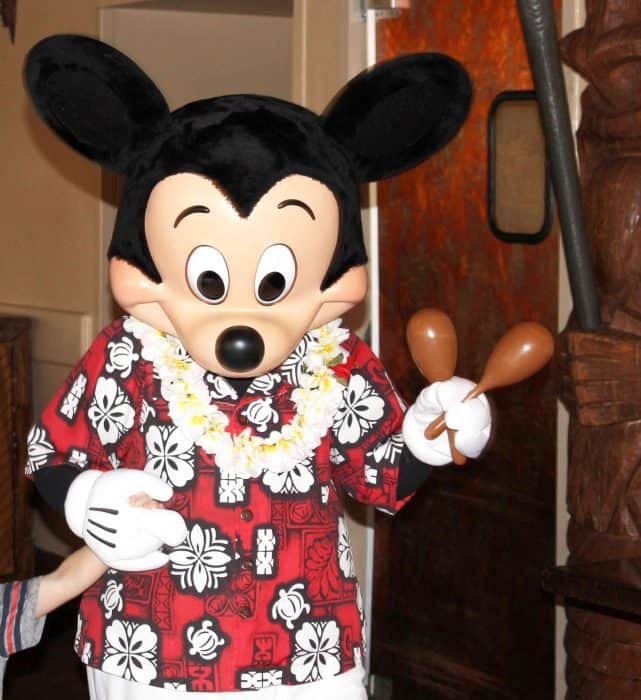 Lilo and Stitch are the main attraction here, but Mickey and Pluto also share in the fun. Sometime during your breakfast, there is a dance party with Mickey leading the procession. Kids get maracas and everyone (ok, mostly kids, but when my daughter was younger, I went too) parades around the room shaking them and dancing. Everyone seems to enjoy this high-energy party. The kids feel special because they get to participate and have fun! 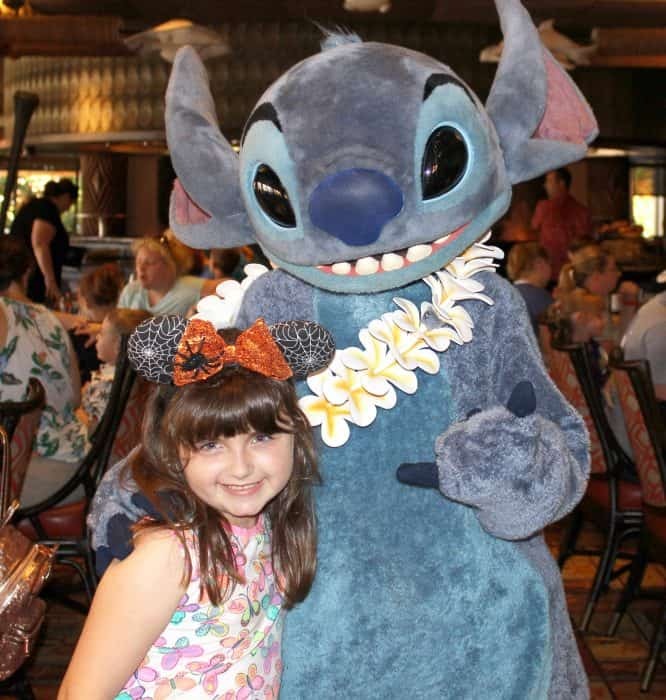 Lilo, Stitch and Mickey came around to each table for pictures and autographs (don’t forget that Sharpie on your Disney packing list – these are all fur characters and need something big to sign their names with). We met Pluto for pictures while we were waiting for our table. There was a dedicated line and a Disney photographer there. This is the first time it occurred this way for us. In the past, Pluto came to the table. I don’t know if it’s now always this way or we just experienced a one-off scenario. Breakfast is family-style. Food is brought to your table instead of you having to get it from a buffet. While I enjoy this breakfast much more than a buffet, this limits your selection so you really need to want to eat the items they bring. And yes, there are seconds (and thirds) if your table needs more. Start off with coffee, tea, juice and their infamous P.O.G. juice. 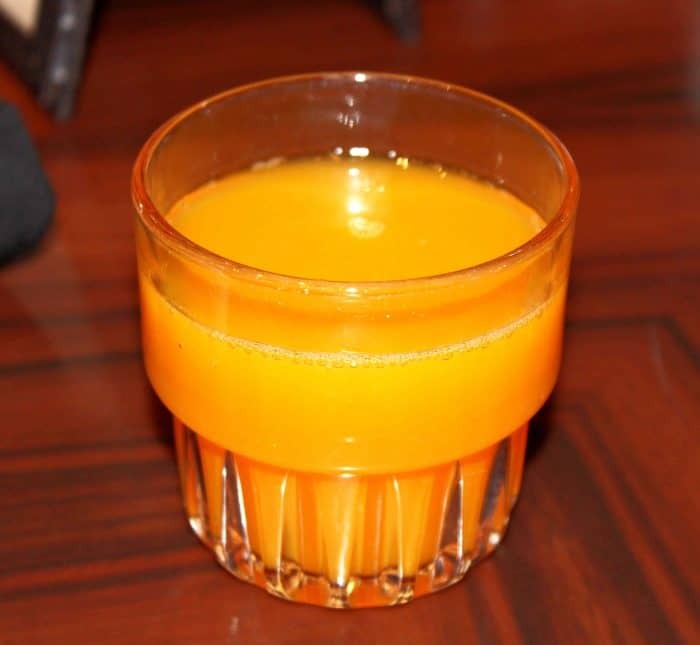 It’s a combination of passion fruit, orange and guava juices. Can I say wonderful! Even my picky eater daughter loved it. Keep the POG juice coming! 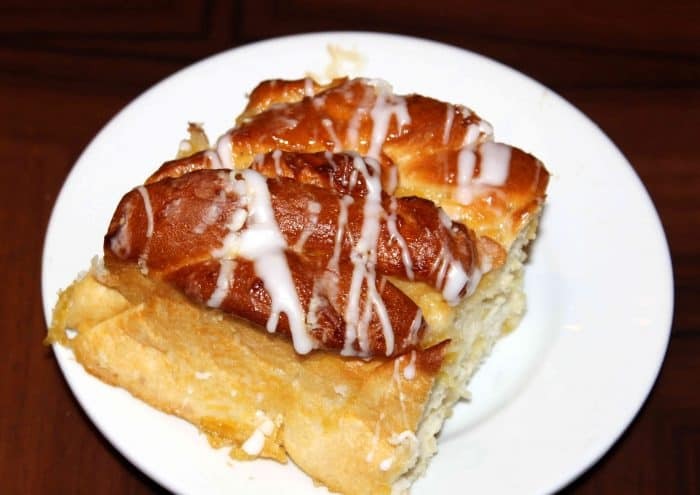 Along with your beverage, their special pineapple-coconut bread is brought to the table. I am not a coconut fan (except in pina colada’s), but this bread is exceptional. It is moist and gooey and I need to stop myself from filling up on it. 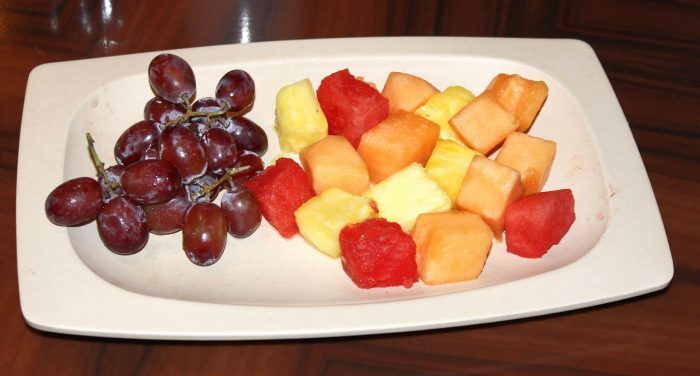 A platter of fruit starts your breakfast. Ours consisted of red grapes, watermelon, pineapple and cantaloupe. Everything was ripe and fresh and we ended up finishing most of it. 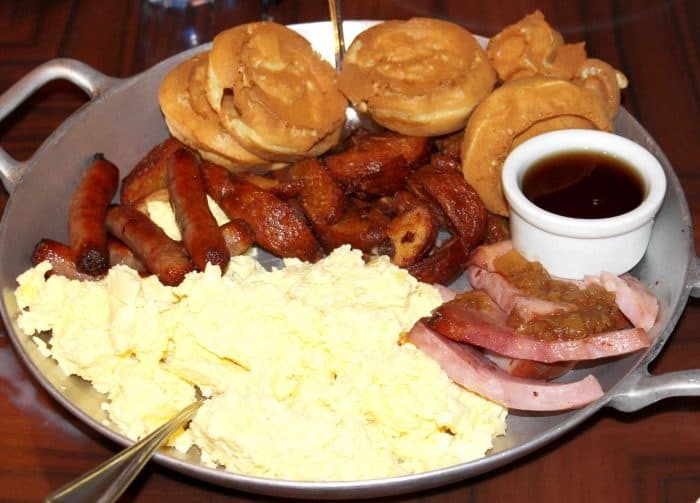 The hot breakfast is served in a large skillet. Depending on how many are in your party, you could receive two or more skillets to your table. Scrambled eggs, pork sausage, ham with a pineapple compote, fried potatoes and Mickey or Stitch waffles with syrup round out the platter. It should also come with warm biscuits, but ours didn’t, so we had to ask for them. There are two great times to make your reservation. The first and best time to make it is 180 days ahead. If you are staying at a Disney resort, this is 180 days from when you check in. Off-property guests can make reservations 180 days prior to the reservation. 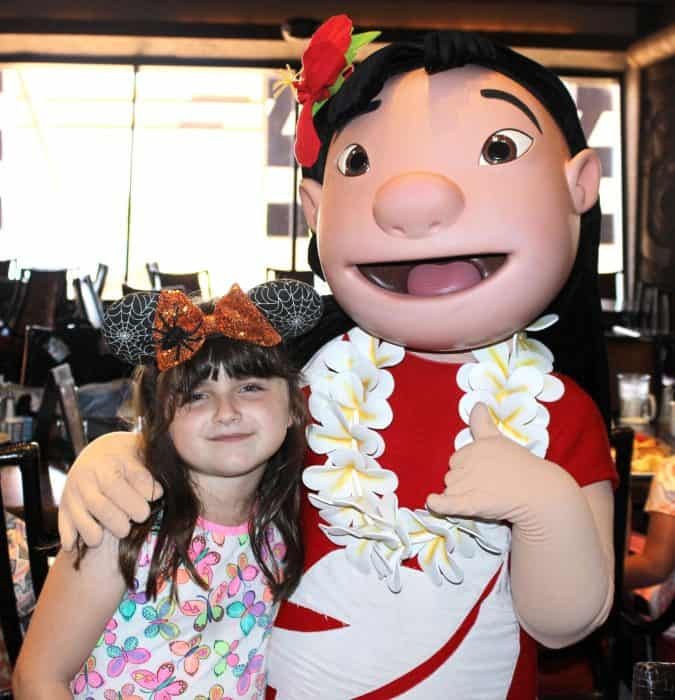 Ohana breakfast reservations are in demand. 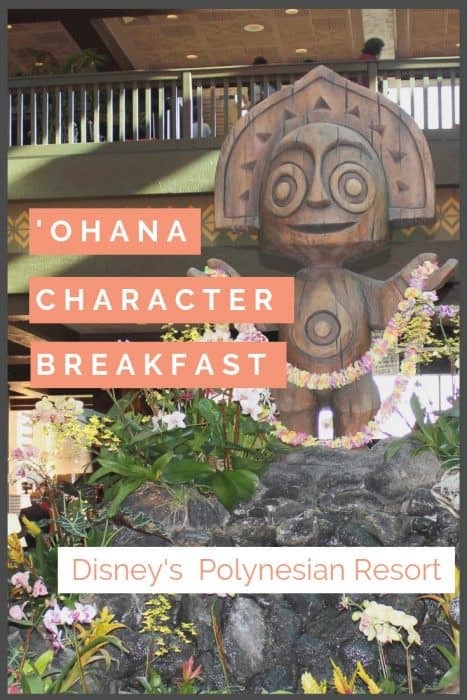 It is a popular character breakfast because of its location on the monorail, plus the ability to see Lilo and Stitch together. If you are able to, plan to make your reservation 180 days out. Log into your My Disney Experience account, click on Thing to Do, then scroll down to Make Reservation. You can filter just for character dining too. The website starts taking reservations at 7:00 am, 180 days ahead. If you can’t plan this far out, your next bet is to look the week prior to wanting your reservation. Disney places a $10 hold on your credit card when you book your reservation and it is refundable up to 24-hours before. Therefore, as the day gets closer, more people are changing their schedules and locking plans into place. If you plan on going to the Magic Kingdom, reserving an early 7:30 am time should get you there for rope drop (assuming it’s a 9:00 am rope drop). I love rope drop, but realize it’s too early for some. Would you like a break from rides? Get to the Magic Kingdom as early as possible, ride for a few hours, then hop on the monorail later in the morning for an 11:30 – 12:00 reservation. This will keep everyone full until dinner. If this is a non-park day, make a mid-morning reservation and ride the monorail around the lake to enjoy the scenery and other resorts before continuing on with your day. If you are on the Disney Dining Plan, this is a one-credit meal. 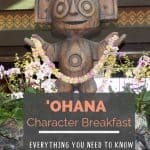 Is the Ohana character breakfast one of Disney’s best character breakfasts? 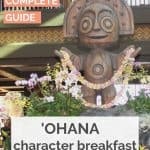 Out of the 10 times we have been to Disney World, we have eaten at the ‘Ohana character breakfast 4 times. Everyone enjoys the food and the entertainment because it is fun, lively and easy to get to. It is definitely one of my family’s favorites and one we come back to time and again. 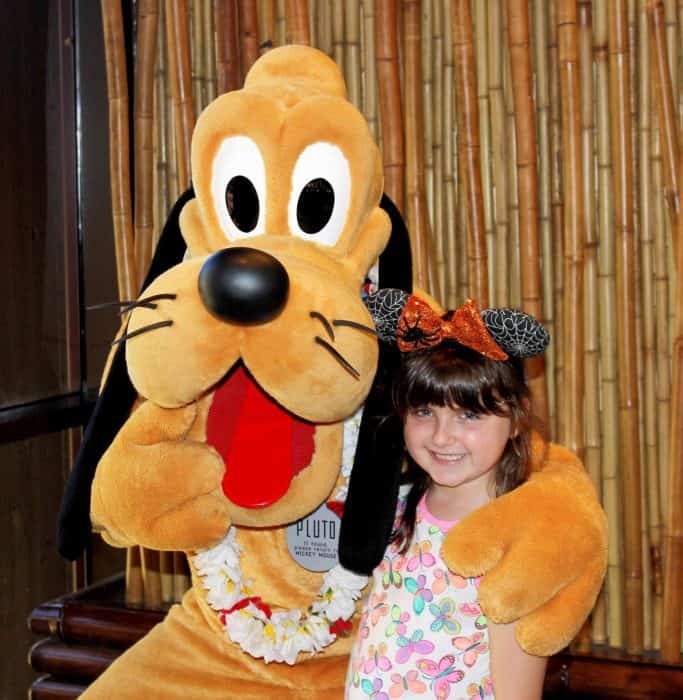 If you need help planning all there is to do on your Disney vacation, download my Disney Planning Guide with Vacation Organizer (free). Sign up for my newsletter and you will receive the password to access the printables in my resource library. 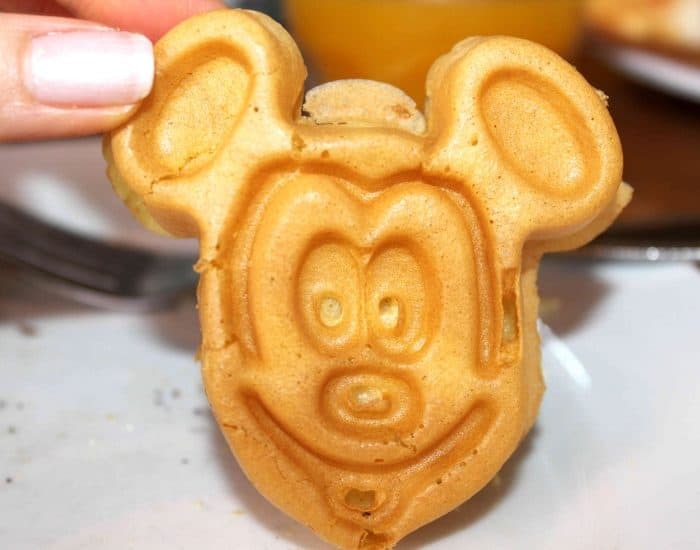 What is your favorite Disney character meal? Please let me know in the comments! If you found this article helpful, please PIN this – thank you! Great post, very detailed! 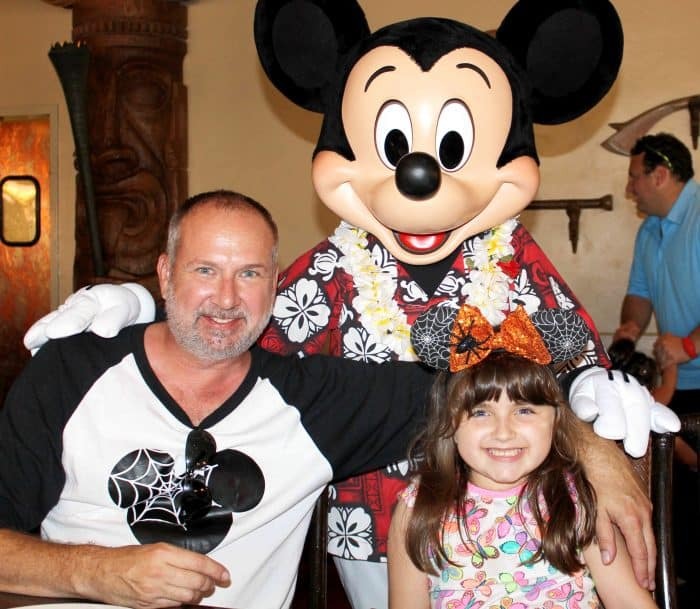 My husband and I have been to Disney twice, pre-children. I’d like to take my two year old son and I am going to bookmark this post for when we eventually go. Thanks for all of the info! We love O’hana for breakfast!! They’re great with gluten free options as well!! I didn’t know that about gluten-free options! Good to know – thank you! We have seen almost new-borns at Disney! Not kidding! You are correct in that a child may not remember it, but I think it’s stored somewhere in their brain and I like to think it helps shape their future. 🙂 Thanks for reading! I remember going to Disney when I was in kindergarten and we went to a character breakfast. It’s definitely a memory that sticks out in my mind. I doubt my parents planned this far in advance though :)…different times then! Back when I was in grade school, I am not even sure they had character breakfasts! LOL. I know I never went to one. There was probably a 25-year gap from when I went as a child and then as a parent. Disney has done an incredible job of expanding, modernizing and marketing (of course, the ticket prices reflect that too). This is adorable! I love Lilo & Stitch. My favorite characters by far! Thanks, Alison. Admittedly, my daughter was 2 when we first went. Stitch freaked her out so much she was screaming. Like good parents, we took her back when she was older. No screaming this time! Oh my gosh your daughter looks SO happy! What a great spot! Thanks! Yes, I always suggest this character meal to people who ask because it is fun and interactive.